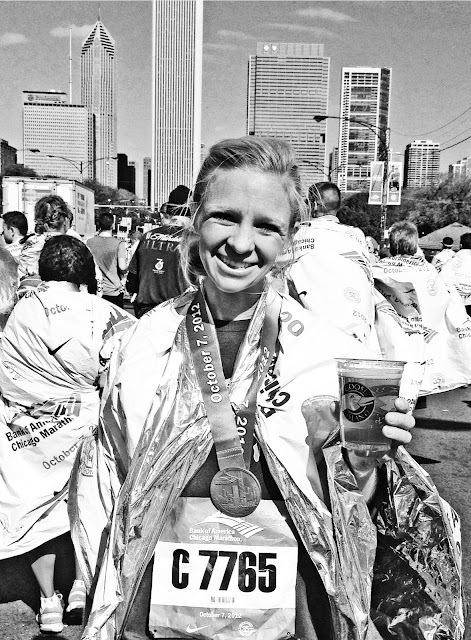 This past weekend I ran the Chicago marathon, along with some wonderful friends and family. And let me tell you, it did not disappoint! The weekend was perfect; no one made fun of me for being all crazy nostalgic about my old home (at least not to my face, anyway), they were up for any random Chicago hangout I threw their way (hooray for low-maintenence friends! very much the opposite of my last Chicago marathon, whew! ), and everyone ended up running a fantastic race! The mid 40's weather is what got me through--I wasn't feeling nearly as exuberant as I did every step of the Air Force Marathon a few weeks ago--instead, this one I never really got focused, but forced myself to go strong until I just couldn't anymore. And wouldn't you know it, that force of will caused me to get another PR! And everyone did a downright amazing job--Zeke got a sub-4:00, Dad beat his Air Force time by 30 minutes, Bethany wow'ed the crowds with her cheering and jumping for joy (I don't know where she gets her energy, but I'm very jealous) and Michele conquered her first marathon like a rockstar! It was fun to stand around Grant Park afterwards, drinking Goose Island 312 and soaking in the celebration of completing one of the largest marathons in the world. Hooray for the Chicago marathon and for the fantastic Huntington friends that ran it!